Posted by elizabethwong in Bebal-ism, Current Affairs, Democracy, Human Rights, Politics. A new year. A by-election. The first politically-motivated arrests of 2009. Fariz Musa, the KeADILan Youth chief of Terengganu, the state secretary Wan Amirudin Wan Ahmad and 4 others were arrested in Kuala Terengganu at 5.10 am while prepping for tomorrow’s nomination day. Surely BN is confident enough of a “sure-win” not to have to resort to such dirty tactics? Posted by elizabethwong in Bebal-ism, Democracy, Human Rights, Malaysia, Politics. One week later, someone goes senile. So — kaput. The new Chief Justice is (junior judge) Zaki Azmi. Four more ‘reforms’ to go. Posted by elizabethwong in Bebal-ism, Current Affairs, Democracy, Human Rights, Malaysia, Politics. The Front for Defenders of Eggs (FRODE) upped the ante early this morning by lobbing two petrol bombs in the house of Teresa Kok. I’m confident the Sentul Police investigations are underway, unless they are a little preoccupied with trying to stop tonight’s anti-ISA vigil at Dataran Merdeka. Posted by elizabethwong in 1, Bebal-ism, Current Affairs, Democracy, Huh? !, Malaysia, Politics. – Former Selangor MB Khir Toyo in The Star, 28 April 2008. Posted by elizabethwong in Bebal-ism, Current Affairs, Malaysia, Politics. I knew there would be hell to pay for a blissful week without internet, news and manic phone calls. First, the PM called us ‘yu sang’. Eh? Then, one had to read about how fantastic the government is at resolving problems. How about this blatant act of “fishing for more” by the Immigration Department down south. “They’re rude and disrespectful. There are other ways to air their protest(EW’s note – They did and you arrested all of them, you git),” X told reporters after attending the Universiti Malaya Alumni Day. X was asked to comment on the action by Bersih members to tear Rashid’s picture as published in the New Straits Times today in protest against the election system in the country. A bare-faced liar too, if he can say all that about Rashid. But he needs Rashid to smooth things out for him. Gimme a bonfire any time. 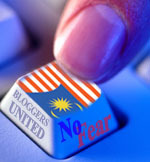 After all, Bebal Nasional (BN) amended the Constitution for a cheat. Posted by elizabethwong in Bebal-ism, Current Affairs, Democracy, Huh? !, Human Rights, Malaysia, Politics. “Meanwhile, another Bersih supporter Norazimah Mohd Noor was charged under Section 504 of the Penal Code with allegedly provoking a police officer on the same day. According to the charge sheet, Norazimah had allegedly provoked Public Safety Division and Kuala Lumpur Traffic chief ACP K Kumaran with the knowledge that her action would cause the police officer to disrupt public security. For the first charge, if found guilty, she faces a maximum two-year jail sentence or a fine or both. As for the second charge, Norazimah could be slapped with a fine amounting to RM100. To Norazimah’s credit, she waived the easy route of merely pleading guilty and paying the small amount. And to think, we can use adjectives such as ‘arrogant’, ‘rude’ even ‘stupid’ etc. on deserving MPs and Ministers, but not on the police? The Rakyat should be Rajas, not the police or the BN in Malaysia. Time to teach these pretenders a lesson. Stop the Rot. Vote for Change.